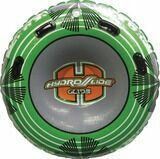 Hydroslide Glide Donut 54" Tube is designed with comfort in mind. The Edge to Edge Comfort Top Covered surface provides a soft, comfortable riding area. Performance is important as well; the embossed "Hydroglide" finish on the PVC bottom moves through the water with less drag. These tubes will hold up through the most extreme riding conditions because of their heavy duty 30 gauge PVC construction, the one piece, high frequency welded quick connect, and injection molded rubber handles. Designed for one rider. 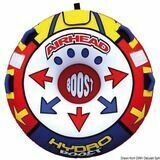 Trailing inflatable, original American Kwik-Tek, model Hydro Boost. Made of PVC electric-welded + nylon tissue + Neoprene protection. Special quick inflating/deflating valve. This shape allows an easy planning also with few horse power. Outside diameter: 138 cm. 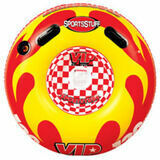 Trailing inflatable, original American Kwik-Tek, model Vip Sportstube. It can tow one person. Special quick inflating/deflating valve. Complete with two. Outside diameter: 137 cm. A classic tube in a new sporty design. The Le Tube has nylon padded handles with neoprene pads underneath. A partially covered Nylon 420 D shell makes this tube very durable and resistant.The valve is located inside and is also covered with a neoprene pad. 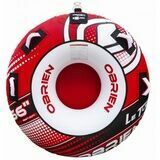 The proven quality of O´Brien stands for longevity and durability, but above all, fun, excitement and action! Super Le Tube for your big tubing sessions with your friends. Diameter: 142 cm. Trailing inflatable, original American Kwik-Tek, model Slide with triangular shape. Made of PVC electric-welded + nylon tissue + Neoprene protection. Special quick inflating/deflating valve. This shape allows an easy planning also with few horse power. Outside diameter: 142 cm. The Super Screamer is one of our best selling tubes and his name says everthing. The construction and quality have been proven over many years by tough testing on the water. 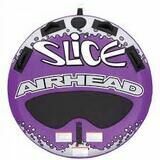 It is manufactured for up to 2 riders and is very resistant concerning his 420 D full Nylon shell. 70” diameter. 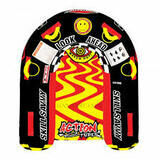 Trailing inflatable, original American Kwik-Tek, model Big Shot. It can tow up to four people. Made of PVC electric-welded + nylon tissue + Neoprene protection. Special quick inflating/deflating valve. Complete with 8 deluxe handles with Neoprene coating. Outside diameter: 194 cm. Let's get ready to Rumble! Our super-fast Rumble can handle 1 person. The inners are made of 24G PVC, which makes it both strong and featherlight. It comes with 4 handles that allow you to sit or lay on the Rumble. Plus a drain to guarantee good water release after a wild ride. Have fun! Trailing inflatable Jobe Equilibrium. 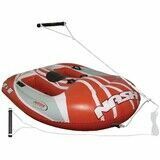 Rider capacity: 2 persons, Large triangular tube, Material: Heavy-duty PVC and Heavy duty 840D Nylon cover, 4 Neoprene handles, Water drain and speed valve. Dimensions: 193 x 15 cm. 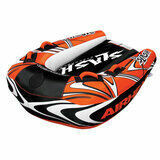 Hydroslide Arrowhead - Triangle shaped tube that features Body Glove’s Patent Pending S3 Technology™. S3 Technology™ is designed to give the rider maximum comfort by providing a seating area that is comprised of Neoprene stretched over the opening in the tube. S3 (Suspended Seating System) cradles the rider inches above the choppy water, providing a more comfortable ride, no matter what the conditions. In addition, all S3 tubes can be used as either traditional sit ins, or as deck tubes as well. Model designed for one rider. Diameter: 142 cm. Trailing inflatable, original American Kwik-Tek, model Slalom Solo. Veer Tow System on the bottom for an optimum balancing. Dimensions: 132 x 125 cm. 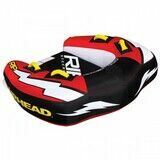 Hydroslide Sit n' Ski Trainer where performance meets value. The wide tails and shallow narrow tunnels assist in easy deep water starts and provide smooth easy turns. Slide adjust bindings fit a wide range of foot sizes as does the proven ski design that the whole family can enjoy. Features: Inflatable ski trainer; Wide design offers a steady platform for easy learning; Fins provide enhanced maneuverability for beginners and lightweight riders; Wooden ski inserts are fully removable; Turns into a towable in seconds; 2-handle rope system allows an adult to release the handle from the boat if the rider starts to fall; Crafted with 6P-free PVC. Kwik-Tek (USA) model Rip II is made with high rigidness technology. Ideal for carving, curves better than circular models. Dimensions: 122 x 127 cm. Trailing inflatable, original American Kwik-Tek, model Slash II for two people. Made of PVC electric-welded + nylon tissue + Neoprene protection. Special quick inflating/deflating valve. High rigidity technology. Ideal for carving since it turns better than circular models. Dimensions: 147 x 122 cm. You'll feel like a king and king, queen and queen or king and queen on this two-persons best-selling throne. Hop around like a frog behind the boat, or go for a chill session on the shore. The tall hang to the Anura's inflatable backrest and its seat provides hours of comfort and back support. The multifunctional Anura is ready for you! Its quick rope connector makes it super easy to connect- and disconnect and its luxurious neoprene knuckle-guard handles offer grip and comfort. It's double-stitched 420D Nylon cover will hold season after season when the Anura is used as lounge chair and for extreme tubing. 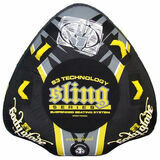 Trailing inflatable, original Body Glove (USA), model Sling Duo. Two-person towable finest cockpit-style, towables, four nylon-wrapped handles have neoprene knuckle guards. Width: 203 cm. The No Fear Hang Time 2 is a 201 x 196 cm two person sit on with dual tow points and is designed to give the rider maximum comfort and enjoyment by providing a neoprene seating area that cradles the towable riders providing for a more comfortable ride, no matter what the conditions. Additionally with the second tow point you can pull from the opposite side and ride it on your knees chariot style. Built to last with an 840D HD Nylon cover and 30 gauge PVC bladder. 6 soft EVA foam handles with neoprene knuckle guards let each rider decide how they want to experience the ride. Designed for two riders. Includes quick connect. 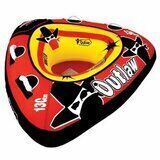 The Drop Zone 3 is a 72" shaped deck tube designed for hours of thrills and spills on the lake. 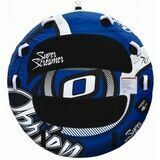 Neoprene across the middle insures that up to three riders can enjoy this tube for hours comfortably. Built to last with an 840D HD Nylon cover and 30 gauge PVC bladder. 6 soft EVA foam handles with neoprene knuckle guards let each rider decide how they want to experience the ride. Designed for up to three riders. Includes quick connect. Kwik-Tek model Turbo Race is a two-seat version of the famous "Big Donut". Dimensions: 210 x 145 cm. Kwik-Tek two-seater Storm 2. It planes with few HP-s. Ergonomic back with internal/external handles. Dimensions: 219 x 190 cm. The Kick Flips shape provides a wild ride for you and your friends or family, yet you can easily switch to an easy ride. With the Kick Flip's dual tow points, you can attach your rope to the front quick connector with 1 or 2 riders sitting down, or connect to the rear to ride in a sporty kneeling position. When the action is over, you can use the Kick Flip as the ultimate lounge sofa to chill. Jobe's Kick Flip has a tough 840D nylon double-stitched cover and a 28-gauge PVC bladder. This next generation Kwik-Tek`s (USA) Mable for 1 to 2 riders has a high backrest, and air cushioned side walls to keep you on board around every whip and turn. Dual Tow Points allow for two completely different riding experiences. 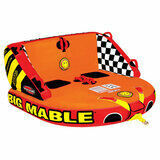 Hook your tow rope up to the front for a deck tube experience, or to the back to sit in the chariot. Tons of Double Webbing Foam Handles with Knuckle Guards and EVA Foam Seating Pads provide a comfortable ride that will keep you coming back for more. Kwik-Tek’s patented Speed Safety Valve and Aluminum Quick Connect Tow point will save you time to keep on the water longer. 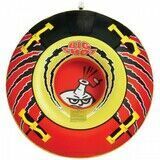 This uniquely shaped classic towable features a Heavy Gauge PVC Bladder and Double Stitched Full Nylon cover with Custom Graphics. Multi-functional is the Big Mable’s middle name, whether its providing a unique towable riding experience or making the perfect lounge at any pool, beach, lake or river. 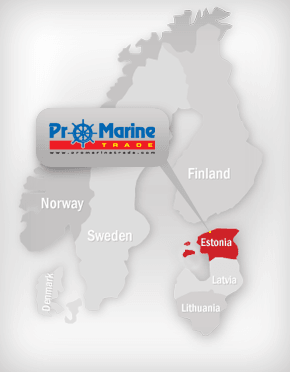 Dimensions: 175 x 168 cm. Trailing inflatable, original American Kwik-Tek, model Hot Dog. It is very funny to use by three people, but very sporty to use just by one. The seat are made in Neoprene for the best control and grip. Dimensions: 255 x 111 cm. Trailing inflatable, original American Kwik-Tek, model Jumbo Dog. It is very funny to use by five people, but very sporty to use just by one. 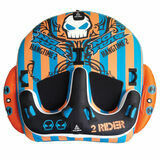 The seat are made in Neoprene for the best control and grip. Dimensions: 375 x 112 cm. WATERSKIES - JOBE MODE COMBO 67"
These high-end skis are perfect for some serious combo skiing and enable you to transition into free ride slalom skiing real smooth. Featuring direct mount bindings, a v-bottom and aluminium fins; this ski gives you perfect control and comfort and maximize your performances on the water. Minimum weight: 50 kg. Size of the bindings: 36-47. Length of the skiis: 170 cm. Waterskies Attaque, model Combo MK II. Wide body water skies for use with low power engines (15/30 HP) and for easier gliding. Adjustable Soft Dual density rubber bindings (size 36-45). Back cross bar for use as monoski. Length: 170 cm. Waterskies Hydroslide, model Victory Adult Combo. Made of HD polyurethane foam with tunnel shaped bottom. Designed to accommodate many different skill levels. Fiberglass/nylon fins ensure years of service. Adjustable soft dual-density rubber bindings (Size 36-45). Fitted with rear cross bar for monoski use. Length: 170 cm. 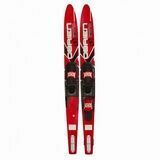 The Traditional has an aggressive shape designed for an easy transition to slalom specific skis. 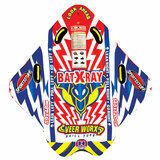 A narrow fore body and deep tunnel help to create strong edge hold and sharp and agressive turns. Length: 172 cm; Binding size: 37-47.